I called several places for prices, and Dave was one of the most honest, fairly prices, and genuine guys around. I highly recommend him! Your San Diego County Bee Removal Experts! Do you have bees in your attic, wall, or water valve box? 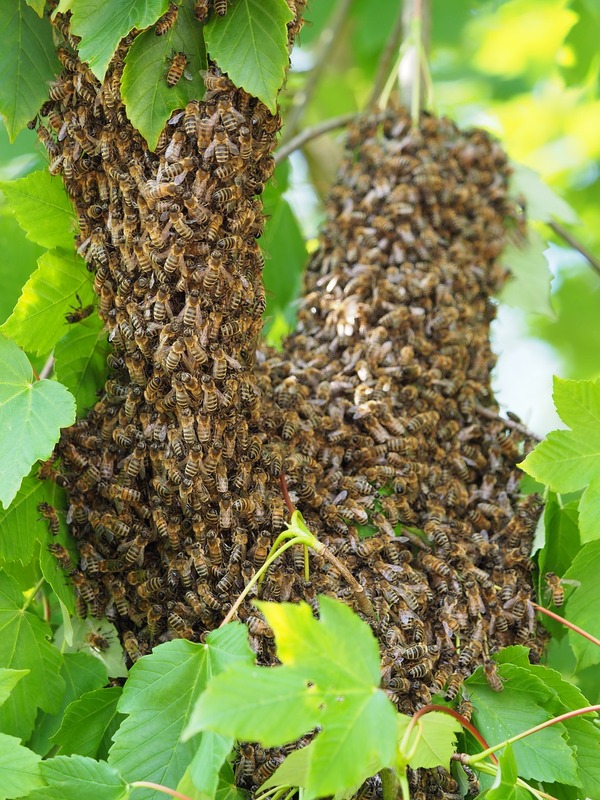 Is there a beehive in a tree or bush on your property? Contact the bee removal professionals at D-Tek Live Bee Removal today! We don’t use any extermination method to rid your property of a pesky or dangerous beehive. Once our trained experts remove the bees alive, they are brought to our local bee farm where they help pollinate farmland. Whether you live in Alpine, Bonsall, Carlsbad, Del Mar, El Cajon, Orange County, Riverside County, Los Angeles County, Encinitas, Escondido, Rancho Santa Fe or Vista, we provide live bee removal and bee removal repairs to all areas of San Diego and North San Diego County. We now also cover all of Riverside County, Orange County, Las Vegas, and Maricopa County. We provide free estimates and inspections. Why is Proper Bee Removal Important? Bees have a very important role in our ecosystem. In fact, they are responsible for approximately 80 percent of the pollination across the world. This means that much of the food that you eat every day, including many popular fruits, nuts, and vegetables are due to the pollination activity of bees. This is why D-Tek Live Bee Removal only uses the most humane, live bee removal methods without the use of any pesticides. After every bee removal is complete, our professionals donate the bees to one of our local beekeepers where the bees can safely continue to thrive and pollinate. We have multiple beekeepers in San Diego County, Orange County, and Riverside County that we donate our honey bees to after every live bee removal. Our relationships with beekeepers across Southern California allow us to greatly reduce the amount of time it takes to transport the honey bees, reducing the chances of the honey bees dehydrating or even dying before we are able to drop them off to the beekeeper. Our trained professionals have years of experience in live bee removal and know firsthand how difficult and dangerous it can be! Let the experts at D-Tek Live Bee Removal handle your beehive removal safely, quickly, and affordably. What Services Does D-Tek Live Bee Removal Provide? Live Bee Removal: We never use any pesticides so you know that our removal methods are not only effective, but safe for you, your family, and your property. Honey Comb Removal: Did you know that bees have an excellent sense of smell? Any bit of beehive that is left behind during removal can continue to attract bees back to your property. Bee Removal Repairs: With over 15 years of experience in construction repair, our expert team can repair any damage to siding, stucco, roofs, or drywall that resulted from the live bee removal process. Bee Proofing: Our expert methods ensure that once the bees are gone, they won’t come back after the live bee removal process is complete. We also perform wasp removal, hornet removal, and yellow jacket removal! Seeing the need for more San Diego beekeepers we are proud to announce the addition of beekeeping services available in San Diego County, California. Same day San Diego County bee removal, beehive removal service, bee control, and bee removal repairs are usually available. San Diego, Riverside, Orange County, Palm Springs, Las Vegas, Maricopa County.